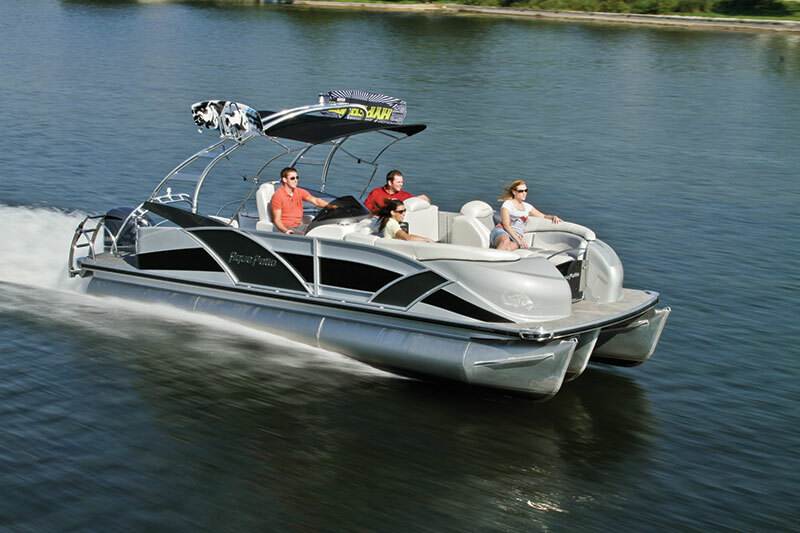 Making a bold pontoon statement is easy when you own an Aqua Patio 250 Express. One of the oft-asked questions I hear is, “What’s the coolest thing you’ve seen this year?” Some years I’m at a loss to name only one thing. But when I took my first gander at the Aqua Patio 250 Express, I knew I would have a ready answer for that question this year. 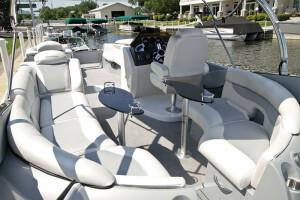 The pontoon has so many unusual features that this section could take up the entire review. First, the overall look is unlike anything you’ve seen before. It’s got fiberglass “fenders” fore and aft that give it a more aerodynamic and flowing look, but the real grabber on this boat is the bright-dipped aluminum tower. Ovoid in shape, it is integrated into the pontoon’s chassis by anchor struts that look like wings and blend seamlessly into the fencing. While it seems precariously attached, I did a few chin-ups on it with nary a wiggle. 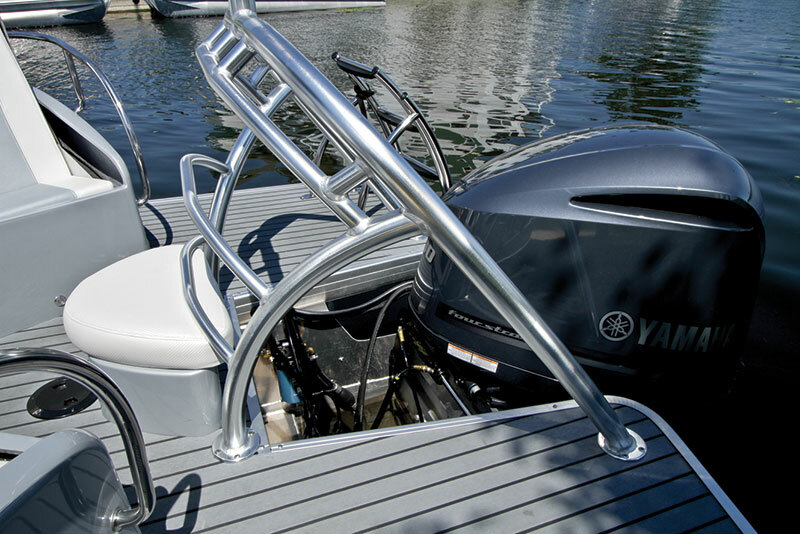 One of the cleverest features on the complete-with-board-racks wakeboard tower is the Easy-Up Bimini top. OK, it took three Boating World crewmembers to figure out how to work it before the Aqua Patio rep got there, but once you know the correct technique, the top lives up to its name, taking only seconds to deploy. 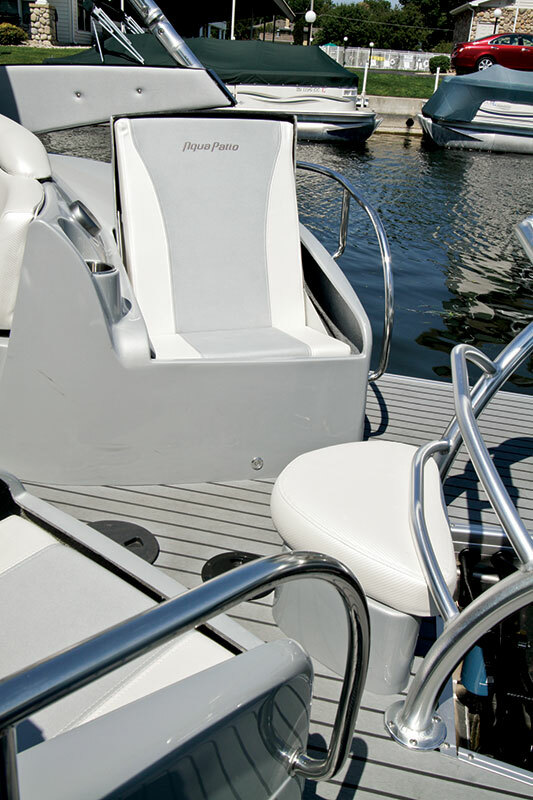 One of the other out-there features is the pair of stern rumble seats. They look like rear fiberglass fenders, but if you grab one of the stainless steel handles and pull, you’ll reveal a seat underneath that would be great for back-porch lounging while at rest. Owners with small children will have to fashion a closure for the rear entry, since its open design doesn’t feature a rear gate. Aqua Patio will rig for any motor brand you choose, but don’t be pennywise and pound foolish by equipping it with anything less than a V-6 outboard. Our test boat sports the 4.2L Yamaha F300, which takes it to its max power. You won’t regret choosing this combination. It reached plane quickly in 2.3 seconds with almost nonexistent bowrise and took just 6.1 seconds to reach 30 mph. Top speed was a very respectable 44.2 mph. According to Yamaha Performance Bulletins, at 32 mph the F300 burns around 13 gph, so you should place an available fuel tank that’s larger than 46 gallons high on your wish list, for added range. 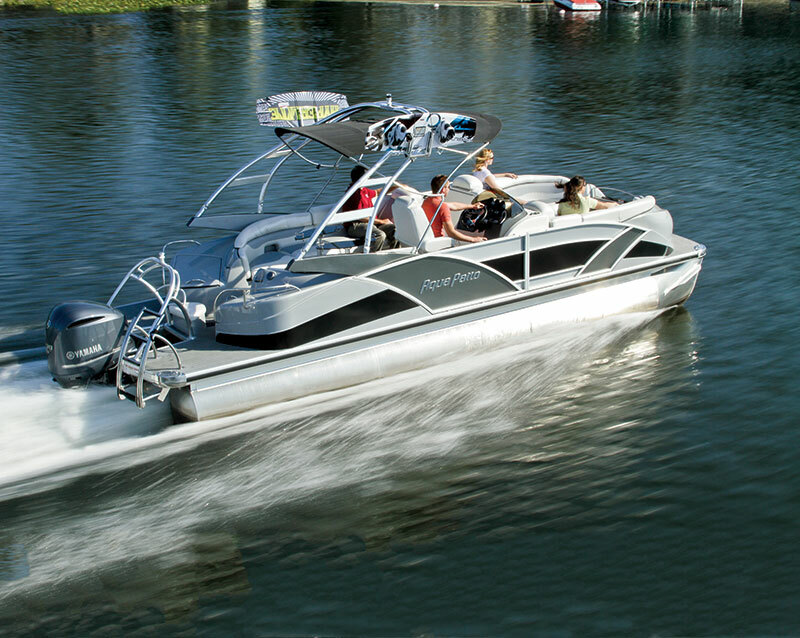 The Aqua Patio 250 XP sports triple 27-inch tubes instead of the usual 25-inchers. While 2 inches doesn’t sound like much, it noticeably raises the height of the deck at floating docks, making it seem like a four-wheel-drive off-roader. The big advantage is it gives you better seakeeping ability when the water gets lumpy. The 250 Express has the G-Force III triple-tube system, which features nosecone sections that look and cut like machetes when slicing through waves. Lifting strakes on both sides of the center tube and on the inside of the outer tubes deliver incredible lift, pushing the already hyper-buoyant oversized logs farther on top of the water. The configuration allowed us to carve incredibly sharp turns that created a significant inward lean. By trimming up slightly, we could get the front half of the pontoon out of the water, to reduce the wetted surface for even more nimble turns. The package also includes an underskin to keep water from hitting the crossbeams like a fire hose and slowing your progress. 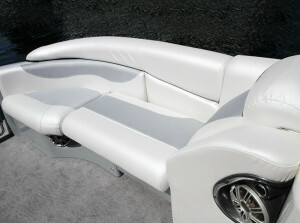 Even at rest, the additional flotation will be a boost when you load the boat down with the maximum 16-passenger load. Clearly this is a boat that’s ready for whatever watersports you can throw at it. Extra ski storage comes in the form of a cavernous center-tube amidships. The tall wakeboard tower provides extra leverage for skier launching, which will be a plus because of the relatively small wake that all the flotation provides. Slalom skiers will love the flattish wake and the lower tow point provided by the stern ski-tow arch, which matches the look of its big brother for continuity. In keeping with the curved look is the four-step stainless steel boarding ladder whose design is more than ornamental. The oversized steps have more outward angle, so you aren’t climbing straight up. The 250 Express actually stretches 26 feet, 10 inches, so Aqua Patio could afford to offer a huge rear deck without shorting you on interior space. The rear deck also gives you a place other than the cockpit to store oversized towable tubes during transit to the kid-scaring zone. As an entertainer, the 250 XP is ready for a full house, and the unique-feature theme continues with items such as the twin slim-line black cockpit tables that are securely anchored. They sit far enough apart in the stern to allow guests to walk between them and can swing away to make scooting out of your seat easier. The gray-accented pearl-white carbon fiber-look upholstery sparkles in the sun and is made from Soft Touch vinyl that is accurately named. Twin recliner sofas in the bow have the perfect amount of angle, but they feature a headrest bulge that poked me right between the shoulder blades. If you are going to have headrests, they should be adjustable, because one size does not fit all. 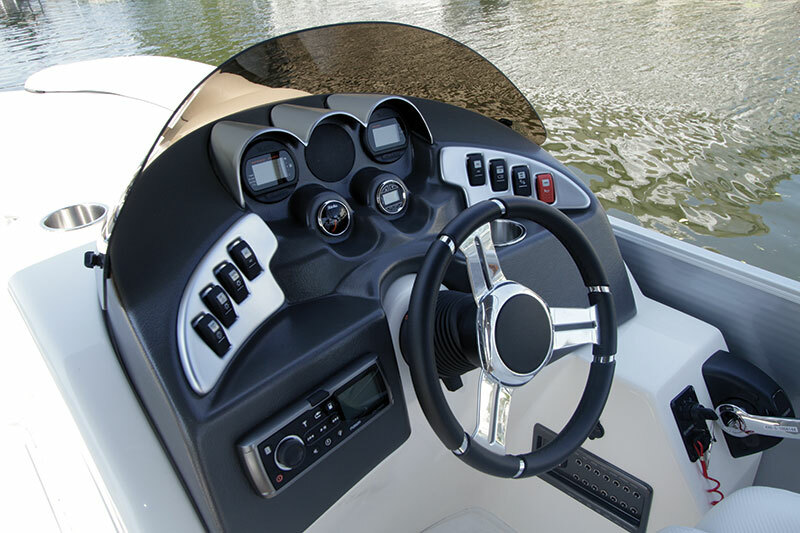 The Express Package includes a sporty wheel at the futuristic helm, along with gray Versa-Teak on the stern platform that offers good grip even when it’s wet. Aqua Patio is Godfrey’s mid-level sporty line of pontoons, and its flagship, the 250 XP, comes well appointed with unexpected standard features such as a Sony stereo system with a subwoofer. 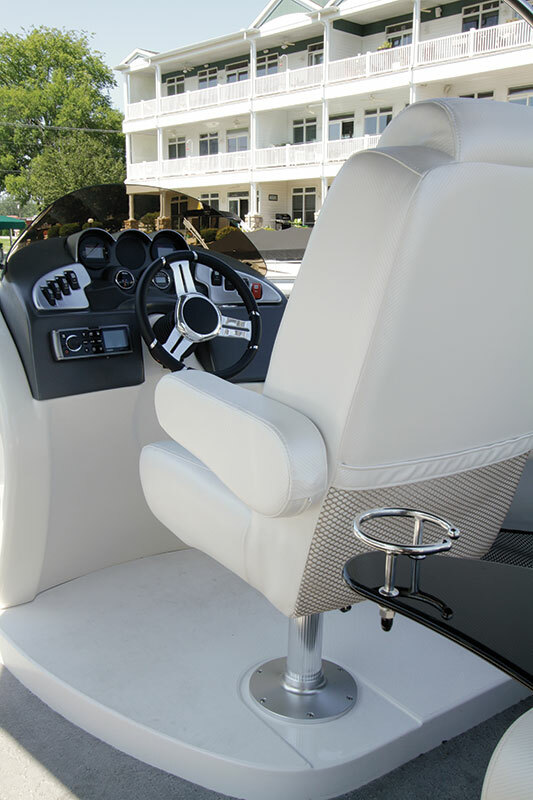 Our test boat has the powerful and highly recommended Fusion Amphitheater system, which includes an iPod docking station. Other standout standards on the 250 Express are the elevated helm, power tilt steering, a changing room and stainless steel corner plates with LED lighting that matches the interior and cupholder lighting. Add some nighttime flash with even more LED lighting underwater and under-deck on the outside fencing. We’ve always been a boating family but had never owned a pontoon boat, which my wife, Tawnie, really wanted. I was hesitant until I saw the Aqua Patio 250 Express and knew immediately that I wanted it. The look is fantastic, and with the triple-toon setup and Yamaha F250 four-stroke, I didn’t have to give up the performance I was used to. We do our boating on Lake Lanier, which is a large lake north of Atlanta with big cruiser traffic that can make it really choppy, but the 250 Express actually handles it better than my previous boat; we just glide right over the waves. We got busted last year by the DNR for riding on the stern in our other boat, but we can use the jump seats because they have a containment rail. The whole family loves watersports, and we ski and tube all day. The 250 Express tows really well and makes it easy with the wakeboard tower and stern ski tow. We like to beach it or head to local restaurants and sometimes go to Sunset Cove. Atlanta Marine has given me great customer service. Anytime I’ve brought it in for service, they’ve always turned it around quickly and gotten us back on the water.